We are all familiar with the mosquito's itchy bite, but we don’t all experience the same reaction. Sometimes we will get a rash from a mosquito bite, to accompany the itch. The reasons and severity of mosquito bite rashes vary from person to person. Some may have a minor flare-up, while for others it could be an indication of a life-threatening reaction. Rashes are never fun, whatever their cause might be. Fortunately, there are ways to identify the early stages and even to prevent them from developing in the first place. What Does a Mosquito Bite Rash Look Like? A rash from a mosquito bite will look different on each person. One thing for sure is that you can tell something isn't right, very soon after being bitten. The area will likely begin to change color quickly, and it might itch more than previous bites. Depending on your skin and immune system health, a rash may appear fiery red and relatively large in size. Some people can develop hives, and these may turn into fluid-filled blisters. Others might only experience minor bumps. You might encounter joint swelling if the bite was close to a joint, such as an ankle or wrist. Some people even exhibit signs of fever. We already know that the rash has come from a mosquito bite. But it is important to understand why some people develop a rash while others don’t. If a rash develops, it generally means you have suffered an allergic reaction. A rash is typically not something that develops merely by scratching, even though the resulting raw skin can resemble one. As the mosquito begins its feast, it injects a series of chemicals into the blood of its victim. 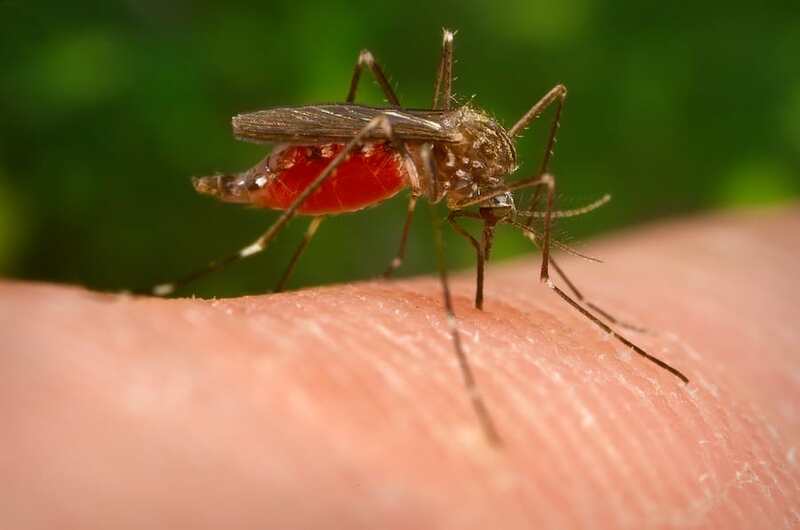 These chemicals work to expand the blood vessels and prevent clotting, thus enabling the mosquito to continue to feed. For most of us, the only symptom we will notice from all this activity is itching and a raised bump around the bite. People suffering from more sensitive immune systems, however, may have a more severe reaction and a rash could develop. If you are bitten by an Aedes mosquito which carries the zika virus, you may develop what doctors call a zika rash. This type of outbreak is characterized by large areas of tiny bumps surrounded by redness. The outbreak generally starts out around the abdomen and quickly spreads to the face and arms. It is typically followed by a rash on the legs and soles of the feet. Similar rashes can also appear due to other mosquito-borne diseases, such as dengue fever and chikungunya. Not everyone will experience this adverse reaction. Fortunately, it usually subsides without causing further damage. If you think you might be carrying a mosquito-borne disease, be sure to consult your doctor immediately. Treating the rash is similar to managing the bite itself. First and foremost, prevent further itching. When you have a rash from a mosquito bite, the skin is already vulnerable. In this case, scratching can quickly lead to infection. The first thing you need to do is clean the area. Avoid scrubbing it with soap and water, and instead take a clean, cold, damp cloth and gently wipe the site. Dab it dry with a towel and apply a soothing lotion. There are a couple of options when it comes to lotions and creams for rashes, including hydrocortisone. You can buy this cream over the counter with a one percent hydrocortisone content. This should be enough to soothe the area. The active ingredient in hydrocortisone, corticosteroids, will work to ease the flare-up. It will reduce redness and swelling and can also ease discomfort such as itching. Calamine lotion is another excellent option. It is not as potent as hydrocortisone, but you can use it to bring extra relief in between doses. You can also apply calamine on younger children, when hydrocortisone is not recommended. Be sure to follow the instructions on the bottle and consult your pediatrician if you've never used it before. In cases where blisters have developed, you should still keep the area clean. However, be extra gentle and avoid bursting them, especially if they contain fluid. Once the blister breaks, it provides a feeding ground for bacteria and germs, which can lead to infection. Once a rash has developed the area will likely swell. As part of the treatment it’s therefore important to try to reduce the swelling. A general rule when reducing swelling is to keep the affected area above heart level by lying down. By doing this, you're promoting blood flow toward the heart, thereby reducing the amount of fluid present at the site. If the swelling is on your arm or leg, place a pillow under the affected limb to keep it elevated. This may also reduce any pain. Unless you have been specifically instructed to do so, don’t wrap the area tightly. This could restrict blood from reaching the area which can eventually have adverse effects. Ice is also excellent for reducing swelling. This is especially true if the rash is located on the stomach or back, for example. These are not easy to elevate, so be sure to ice them instead. When you do apply ice, remember, do not administer it directly onto the skin. Ice can cause burns, so it is vital to wrap it in a small towel or other fabric. It is also important not to leave the ice in place for more than 10 minutes at a time. Apply regularly throughout the next 24 hours and the swelling should subside. Be sure keep a close watch on the site. Excessive swelling could be the sign of an unwanted development such as infection. If the swelling should progress and doesn’t subside, consult your healthcare provider. Rest is a key ingredient to a full recovery. Whether the rash was from allergies, too much scratching or a virus, it will usually recede within about a week. During this time, it’s best to take it easy, or at least avoid activities that can cause further irritation. The best way to avoid a rash is to avoid the trigger, which in this case is mosquitoes. This is not an easy task since they are pretty much everywhere as soon as the weather warms up. Unless you want to spend the glorious summer evenings behind closed doors and windows, use a mosquito repellent. There are so many different options available that it’s difficult to know which one to use. To best protect both your skin and the environment, look for one which is EPA (Environmental Protection Agency) approved. The EPA recommends using a repellent with one of the following active components: DEET, IR3535, oil of lemon eucalyptus (OLE), 2-undecanone, para-menthane-diol (PMD) or picaridin. Chemical repellents can potentially be harmful. The approved ingredients above, used according to their specific instructions, are considered safe. Some people prefer to use more natural alternatives in the form of essential oils. If you want to use this option, be mindful of allergies and do further research first. Certain oils can be unforgiving to the skin, leaving you with further outbreaks. Be extra vigilant when choosing repellents for children or babies. If you treat the rash quickly or take preventative measures, you will greatly reduce the risk of any complications developing. Nonetheless, a rash can lead to infection, especially if there are blisters which burst. The area is already raw and vulnerable, making it extra important to keep it clean and dry. Treat the blister area with an antibacterial cream or lotion, and cover it with a dressing until the area is healed. Another complication, called anaphylaxis, can occur if you are sensitive to the insect venom. This is a severe allergic reaction which causes throat swelling, wheezing, faintness, and hives. If you suspect anaphylaxis, seek medical treatment right away. I hope you have gained some knowledge from this information and you now know how to successfully treat a rash from a mosquito bite.